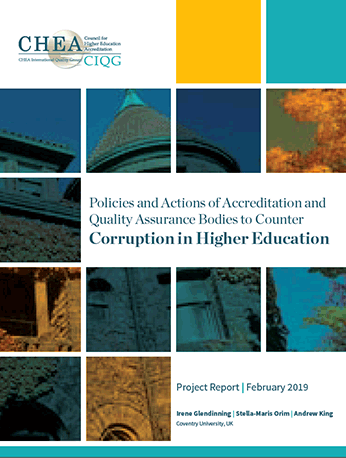 A global study conducted during 2017-18 for the Council for Higher Education Accreditation International Quality Group (CHEA/CIQG) builds on the Advisory Statement for Effective International Practice, Combatting Corruption and Enhancing Integrity: A Contemporary Challenge for the Quality and Credibility of Higher Education (Advisory Statement) by IIEP / UNESCO and CIQG (IIEP & CIQG 2016). 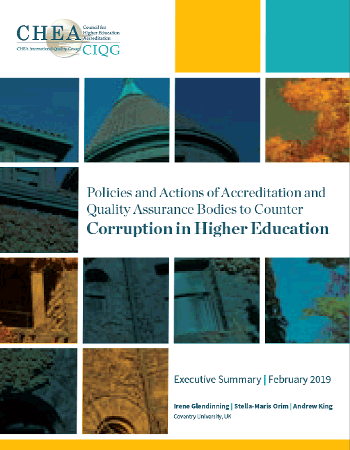 This study captured information about actions and responses of accreditation and quality assurance bodies (AQABs) to address different forms of corruption in higher education. Please note: the links to the sections in the Full Report will only connect when using Chrome, IE, or the latest version of Firefox ("Firefox Quantum"). Read the full Project Report.